What is it? 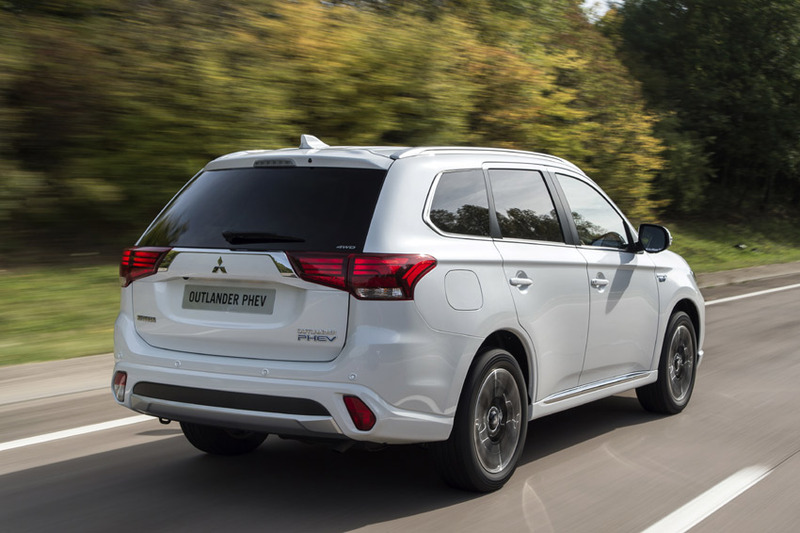 Mitsubishi have gained huge success from the Outlander PHEV (Plug-in Hybrid Electric Vehicle) and it has become the UK’s best selling plug in vehicle, the new model has many new benefits including an improved exterior look. Who is it aimed at? 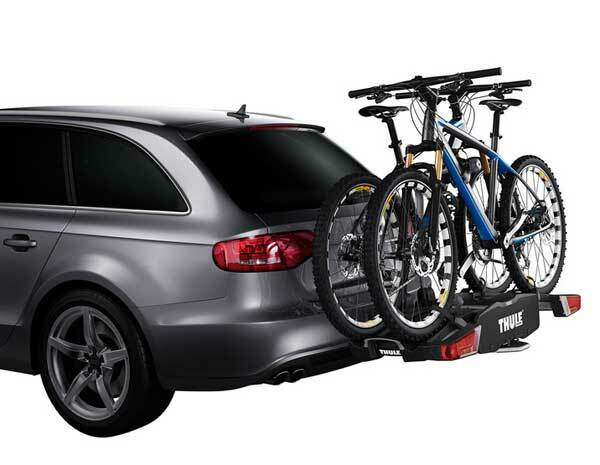 A hugely diverse vehicle the Outlander has plenty of space for family and business use, with the added facility of four wheel drive. The PHEV variant doesn’t however offer 7 seats like the diesel version does. The tax benefits and low running costs make it an ideal company car if travelling around London or for short to medium commutes. What about the Styling? A huge improvement over the outgoing Outlander the new one has been rewarded with a more European and mainstream look that should appeal to the masses more. There is a redesigned front end with LED daytime running lights and a ‘Dynamic Shield’ that embodies Mitsubishi’s distinctive triple diamond badge. The Outlander is longer than its predecessor and lower which gives a better stance on the road, and the rear also gets new light clusters and bumpers. The whole image is now a lot more appealing. Under the bonnet? This is where the car excels, next to a conventional 2.0 litre petrol engine is a generator, there are also two motors, one that sits on the axle at the front and one at the rear. The engine is used to power the car on longer journeys and to generate electrical power to store in the batteries which are located under the vehicle. The transition from Petrol power to electrical is incredibly seamless, there is no jolt whatsoever. The only option is an automatic gearbox which includes a regenerative brake system that allows you to take your foot off the accelerator and slow the car down without using the brakes and also storing up vital electrical energy. 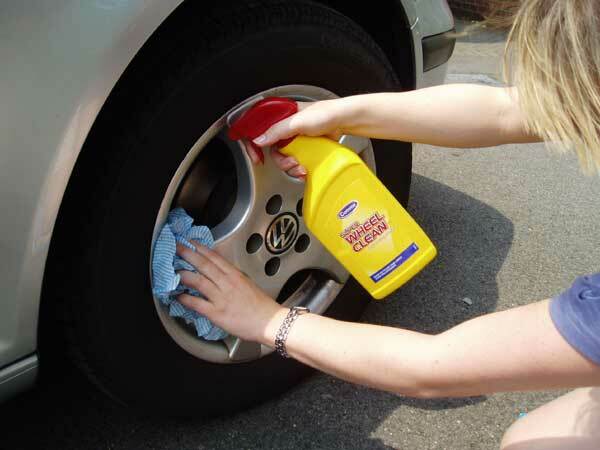 The batteries can be recharged using a normal household plus, this can take up to 5 hours. What about inside? The interior has benefited from a splash of European persuasion and quality does feel a lot better, but is still not up to the standards of its rivals. The materials used are improved and include more soft touch upholstery. The centre console has a black ash finish and chrome detailing and without being cluttered there is everything you would need. Mitsubishi Multi Communication System has been upgraded and benefits from a faster package. 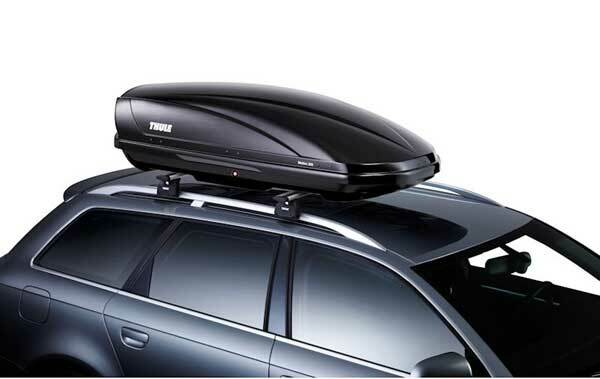 There is plenty of room in the Outlander for driver and passengers to have a comfortable ride, the split rear seats are easy to fathom out and help the Outlander gain a huge 1603 litres. On the road? 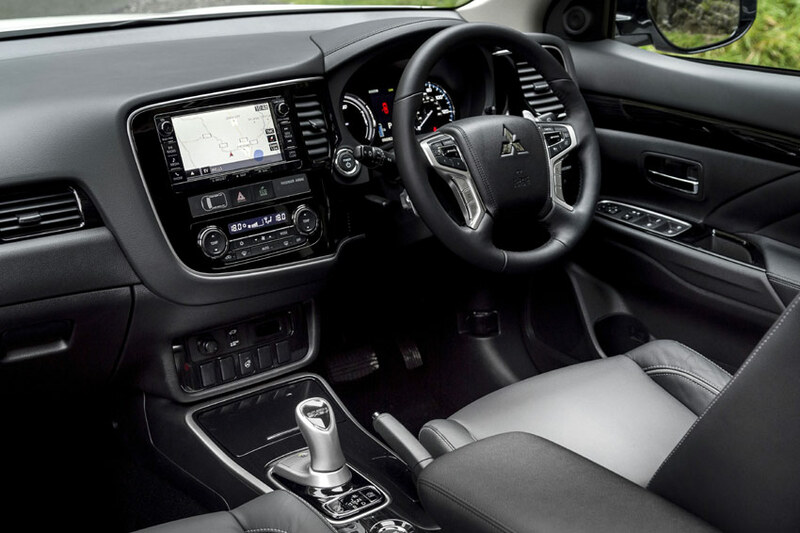 Mitsubishi have worked hard at making the driving experience a more pleasant affair, sound reduction in over 30 areas should definitely help that. The suspension has been tweaked and the Outlander does feel more composed than before, the steering is ok and the whole ride is nice enough, the car is comfortable on long journeys but any motorway mileage will simply drink away the petrol and lead you to become extremely friendly with your local petrol station. The range of 32.5 miles of electric power is great around the cities and depending on your lifestyle could work out very cheap, if you do continuous motorway driving stay well away from the PHEV. And Safety? The Mitsubishi Outlander received the full 5 stars on the Euro NCAP and comes with seven airbags, City Crash Provision and RISE (Reinforced Impact Safety Evolution) all as standard. The RISE system is a design that disperses energy during an impact to the vehicle to the side or rear, distortion is controlled to protect occupants and the fuel delivery components. The Outlander also comes with a plethora of other safety features including a speed limiter, brake assist and hill start assist. What are my Options? The whole Outlander range is very well specced, the entry level GX2 comes with cruise control, climate control, LED daytime running lights and auto dimming rear view mirror all as standard. The top spec GX4 comes with electric heated leather seats, electric tailgate, reversing camera and LED headlights. Metallic/Pearlescent paint is a £500 extra and a Protection pack which includes mats, door sill protectors and mud flaps is a £279 option. Will it break the bank? Economy has been improved on this model with mpg up from 144 to 156, the CO2 has been reduced to 42 g/km and the Outlander still retains its free tax and no congestion charge charms. The £5000 Government grant also brings the price down and makes it comparative with the Diesel model. 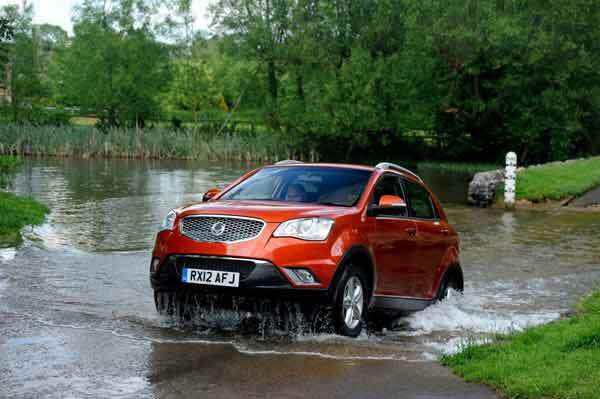 There is no denying that this car could work out extremely good value for company car users in and around cities and towns, there is also the added benefit of its 4×4 capabilities. So the verdict? 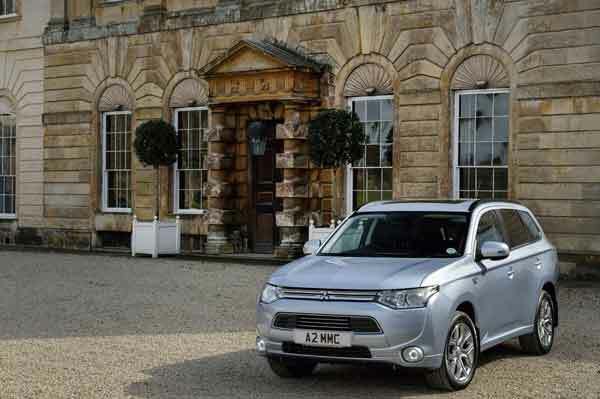 Having never driven a Plug in Hybrid car I did have a few reservations about it, the popularity of the Outlander PHEV shows that Mitsubishi have got it right, and at the moment they command a niche market. The Outlander PHEV for the price is packed full of technology which works tirelessly under the cars body and the figures speak for themselves. Motorists with short to medium commutes would save a lot of money, but simply put if you travel over 70 miles a day, and use fast roads then ignore the PHEV and buy a good old diesel burner.